The Department of the Treasury (DoT) is an executive department and the treasury of the United States federal government. It was established by an Act of Congress in 1789 to manage government revenue. The Department is administered by the Secretary of the Treasury, who is a member of the Cabinet. Jack Lew is the current Secretary of the Treasury; he was sworn in on February 28, 2013. The first Secretary of the Treasury was Robert Morris (who declined, recommending Hamilton instead). Hamilton almost single-handedly worked out the nation's early financial system, and for several years was a major presence in Washington's administration as well. His portrait is on the obverse of the U.S. ten-dollar bill while the Treasury Department building is shown on the reverse. (a) The Department of the Treasury is an executive department of the United States Government at the seat of the Government. (b) The head of the Department is the Secretary of the Treasury. The Secretary is appointed by the President, by and with the advice and consent of the Senate. President Alexander Hamilton as the first United States Secretary of the Treasury on September 11, 1789. He left office on the last day of January 1795. Much of the structure of the government of the United States was worked out in those five years, beginning with the structure and function of the cabinet itself. Congress transferred several agencies that had previously been under the aegis of the Treasury department to other departments as a consequence of the Homeland Security Act of 2002. The law enforcement functions of ATF, including the regulation of legitimate traffic in firearms and explosives, were transferred to the Department of Justice as the Bureau of Alcohol, Tobacco, Firearms, and Explosives (BATFE). The regulatory and tax collection functions of ATF related to legitimate traffic in alcohol and tobacco remained with the Treasury at its new Alcohol and Tobacco Tax and Trade Bureau (TTB). 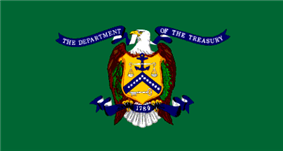 The Office of the General Counsel is charged with supervising all legal proceedings involving the collection of debts due the United States, establishing regulations to guide customs collectors, issuing distress warrants against delinquent revenue collectors or receivers of public money, examining Treasury officers' official bonds and related legal documents, serving as legal adviser to the department and administered lands acquired by the United States in payment for debts. This office was preceded by the offices of the Comptroller of the Treasury (1789–1817), First Comptroller of the Treasury (1817–20), Agent of the Treasury (1820–30), and Solicitor of the Treasury 1830–1934. 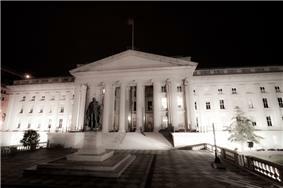 ^ "An Act to Establish the Treasury Department". September 2, 1789. Retrieved 2014-11-05. 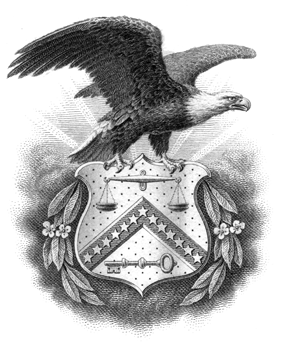 ^ "U.S. Treasury – Act of Congress Establishing the Treasury Department". Treasury.gov. 2010-10-26. Retrieved 2014-07-14. ^ I.R.C. Section 197(g), 469(l), 1017(b)(1). 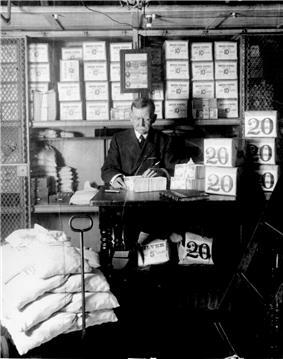 ^ Treasury Order 101-05, U.S. Dept. of the Treasury. 10 Jan 2011. Updated 26 Apr 2011. Accessed 11 Nov 2012. ^ DF Org Chart, "The Office of Domestic Finance." U.S. Dept. of the Treasury. Oct 2011. Accessed 11 Nov 2012. ^ International Affairs, "About International Affairs." U.S. Dept. of the Treasury. 14 Feb 2012. Accessed 11 Nov 2012. ^ Terrorism and Financial Intelligence, "About Terrorism and Financial Intelligence." U.S. Dept. of the Treasury. Jul 2 2012. Accessed Nov 11 2012.